This page has contact information, locations, and other useful information about the AFM instruments in the AFM TwinLabs located in Requimte labs in Porto and Lisbon, Portugal. 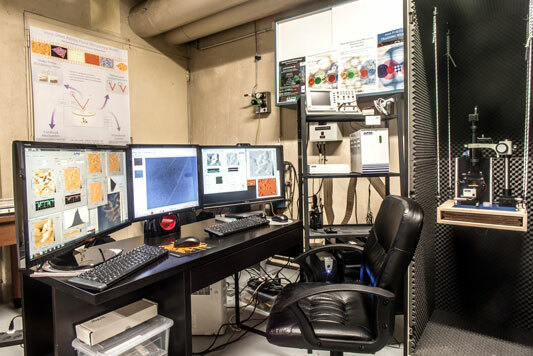 This page is intended for users and potential users of the instruments; for more information about Atomic Force Microscopy (AFM), see the links on the left. 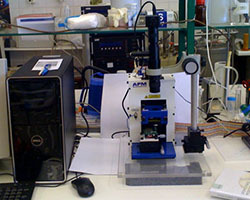 The two labs are equipped with TTAFM instruments from AFM Workshop. The Porto AFM Workshop 2016 has finished recently, it ran from the from the 18th April to 21st April. This is a training workshop, aimed at any researcher or scientist, who wants to learn about AFM, or increase their knowledge of the technique. Following the successful courses that ran in 2011, 2013 and 2014, the course will included several hours hands-on training in acquiring images with the atomic force microscope as well as AFM data processing. As well as lectures on practical classes, the course featured advanced topics lectures from guest scientists in biology and materials science. A report on the course was published here recently and the results from the image competition we ran will be announced soon! For further details about the facilities in the Porto lab click here or click on the picture above. For further details about the facilities in the Lisbon lab click here or click on the picture above. · See booking schedule, make bookings at the Twin-lab – for registered users of the instruments only. · You can use the following links to download the software required to process the images from the Requimte instruments. This software is Gwyddion, which can be found at Gwyddion.net. There is a user guide for this software here. It is recommended to use version 2.22 or above of Gwyddion. For other AFM/SPM software, look here: SPM Software. · To access materials specific to one of the labs, click on the lab you are interested in above. The locations of the two AFM labs in the TWINLAB are shown on a google map linked to below. Click the markers on the map for full address details. Contact details can be found on the pages describing the two instruments linked above (click on the instrument pictures).